Augsburg College’s $73 million, 135,000-square-foot Norman and Evangeline Hagfors Center for Science, Business, and Religion is the largest construction project underway at Twin Cities private colleges and universities. 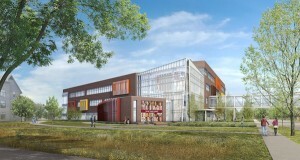 Finance and Commerce included details on the project’s scope, timeline, and funding in an article that outlined summer building and renovation projects on campuses across Minnesota. Scheduled to open in January 2018, the Hagfors Center will be Augsburg’s newest and largest academic building. The facility — designed by Minneapolis-based HGA Architects — features a student-centered layout that will foster intersections among areas of study and encourage collaboration. As the Finance and Commerce article noted, the Hagfors Center was the focus of a successful $50 million fundraising campaign that exceeded its goal. Comprehensive project milestone information is available through weekly updates on the Hagfors Center website.